These cheap and easy lunch ideas for work will make packing lunches a snap. Want to save a ton of money? 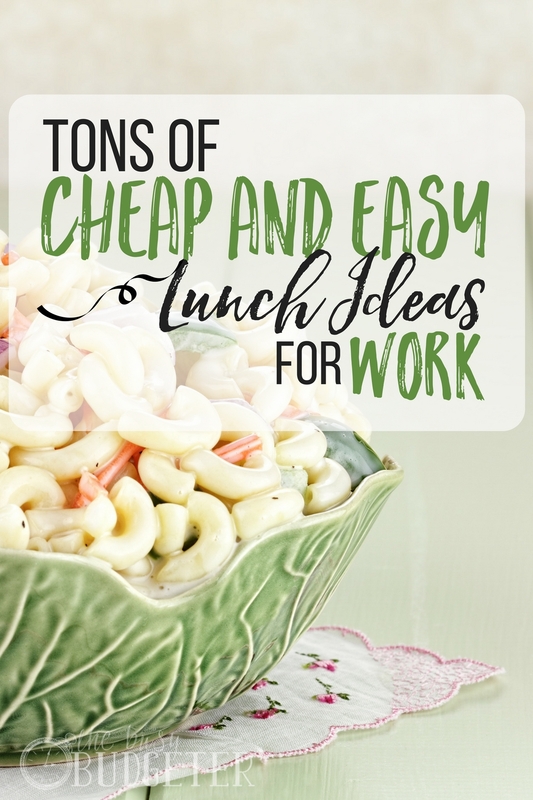 Having a list of lunch ideas for work handy is one of the smartest ways I know to do that… We were spending over $100/week to eat at work between the two of us until we finally got smart and made a routine out of packing simple lunches. If you want to save money, packing a lunch is a great place to start. After all, how easy is it to use “I forgot” or “I’ve got nothing to eat” as an excuse to hit the drive-thru or your local sub shop? We’ve all done it. It’s convenient, and well, sometimes it’s pretty delicious. But all of those little purchases add up (not to mention the calories). Even if you go for a healthy salad option or pick up a “lunch pack” at your coffee shop, you’re still looking at dropping at least five bucks on a lunch that’s probably less-than-stellar. A while back I wrote a post on lunch ideas for work—all very quick, convenient lunches you can grab and go. As I said back then (and wow, is it still true): life is unpredictable. Life doesn’t care that you’ve made very exact menu plans and your whole day is full, down to each and every 15-minute timeslot. Just like anything, I like to tackle curveballs with a solid back-up plan. I’ll admit, some of my previous ideas for “back-up plan” lunches weren’t super-awesome, healthy, watching-my-weight options. But they got me started on the path to packing lunches. Once I had that habit down, I could start working on healthier options. After a few more years of packing lunches and needing back-up lunches (and back-up, back-up lunches), let’s just say I’ve now got a few more lunch ideas for work up my sleeve beyond canned ravioli and sodium-filled soup. These ideas are super easy. While I wish I had time to cook and prepare beautiful lunches every morning (I love cutesy bento-box lunches and sandwiches cut in cartoon shapes and all of that)—let’s get real. These back-up, quick and easy work lunches are go-to items you can keep on hand, make ahead, stock in your pantry and grab-and-go. You don’t need cooking skills or crazy ingredients, and these lunches will keep you satisfied, fed, happy, and away from the drive-thru! Some mornings you might have more time or you might be able to prepare lunches the night before. If you have time to cook, the sky’s the limit: pasta salads, soups, burritos, yummy grain bowls and more! But if you run into morning crunch time, it’s good to have a few tricks up your sleeve and go-to ideas to help you stay successful and not cave to fast food. Two key factors when it comes to regularly taking your lunch to work: 1.) Keep your pantry and freezer stocked with easy items that can turn into a back-up lunch whenever you need something to take, and 2.) Get a cute lunch bag or container—something you can reuse over and over again that inspires you to bring your lunch. Get excited about your lunches and you’ll always be prepared! Yes, I’m talkin’ leftovers from last night’s dinner. Anything left over can work as a lunch solution. Double up your dinner and you’ll always have something ready for tomorrow. But even if you don’t double up, if you have a few bites left over, you can totally use it. Sometimes I throw cooked vegetables and protein over some lettuce for a quick salad (super easy, even if you don’t have access to a microwave at work). A classic, and for good reason! Just freeze two slices of bread in a Ziploc baggie. You don’t even need to purchase an extra loaf for this, if you’re like me and you freeze bread for a month at a time. Just grab 2 or 4 slices out of the loaf you’re currently using. I normally have a few slices left by the time it expires, so this works out well. Keep peanut butter and jelly in the pantry (where it probably already is). You can spread the peanut butter and jelly onto the frozen bread; it will thaw by the time lunch comes up. If you actually like PB&J and plan to have it more than once a month, keep in mind you can also freeze ready-made sandwiches. Just make sure to spread a bit of peanut butter on both sides of the bread to prevent soggy bread. Frozen bread only stays good for about a month, so I wouldn’t do this unless you plan to eat your sandwiches within that timeframe. Technically leftovers, DIY TV dinners are one of our go-to solutions that I just love. Portion your leftovers onto waxed heavy-duty coated plates, and then wrap them and seal (and vacuum seal, if you have a vacuum sealer). When you’re ready to eat your DIY TV dinner, you simply microwave it and enjoy! Besides being cheaper and healthier than store-bought microwave dinners, these are a great way to use up little bits of leftovers you might not otherwise save. I know when there’s a few spoonfuls of rice, potatoes, or veggies, I used to just chow down on them or throw them out rather than packing them up in the fridge because it seemed silly to save such a small amount. Now I actually get excited that I can save these little bits as a side for a TV dinner! Want to ramp it up a notch? We ended up making a week of healthy TV dinners for our family of four in less than three hours and for under $100/week. Okay, so we’ve all seen the adorable salads in a jar on Pinterest and various blogs, right? 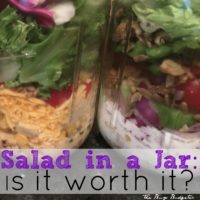 I decided to give the salad in a jar a try, and it’s definitely worth it! They last a long time, and they’re easy to make ahead during your weekend meal prep. These things last all week long! A few words of warning about these salads: If you use meat, keep in mind that it shouldn’t be stored for longer than four days. If you’re picky like me about food storage guidelines and safety, you’ll have to make some fully vegetarian salads so they’ll store for a week or more. They also aren’t the easiest things to eat out of the jar, so you’ll need to grab a bowl or something to dump the salad into when you’re ready to eat it. Other than that, salads in a jar are an awesome option, and you can mix and match in so many ingredients. 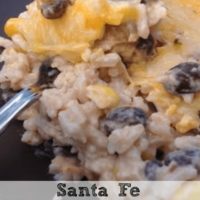 Try using up leftovers like beans, rice, veggies, chicken, beef and cheese. Plus, let’s face it, they look great and they’re fun to make ahead. Keep a can of shredded chicken in your pantry and mayonnaise in your fridge (you probably already have this). Freeze 2 slices of bread in a Ziploc bag. Mix the chicken and mayonnaise, add salt and pepper and any other ingredients you have hanging around, and scoop between frozen bread. By the time lunch rolls around, the bread will thaw. **For this sandwich, use a cooler pack in addition to the frozen bread to keep the sandwich cold. I like ham and Swiss, turkey and Muenster, or roast beef and provolone, but you can literally use anything that floats your boat. Watch for cold cuts and cheese on sale, and freeze if needed. Add lettuce, tomato, and pickle or use whatever you have left from your dinner ingredients to top. Mmm, who doesn’t love bacon, lettuce and tomato? For an easy way to make bacon ahead of time to freeze, click here. Toast the bread before layering the bacon, iceberg lettuce, and tomato. You can also add cheese if you’re into that. These are so good and so easy! Microwave 2 breasts of Tyson’s grilled chicken fillets and dice up, chop up a beefsteak tomato, then fill burrito tortillas with diced chicken, canned corn, diced tomato, and cheddar cheese. Serve with ranch dressing and a salad. Makes about 4 wraps, so if you have leftovers, wrap in wax paper and foil and take to lunch the next day. These are just a few quick-and-easy work lunch ideas to get you started. With a little simple pantry and freezer storage and some planning now, you can rest assured you’ll have successful mornings when you need to get yourself (and your family) out the door with no time to prepare a meal. Hint: If you have a freezer available at work- I leave a TV Dinner in there that I’m NOT excited about as motivation to remember my lunch. If I forget it, I have to eat the TV Dinner that I don’t like. What are your favorite go-to options for work lunches? Work lunch is by far my biggest struggle! My problem is I don’t really get full off of a sandwich and chips, and when there’s no leftovers leftover ( 🙂 ) I have a hard time figuring out what to take. 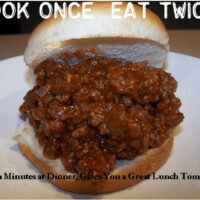 I will have to try some of these ideas–love the sound of the make your own TV dinners! I love to grill so when the weather permits it, I load up my grill with chicken thighs and pork steak and sausages (purchased on sale, of course) and grill away. I can get a week’s worth of lunches and breakfasts out of a few dollars of meat. Thank you for all of the suggestions. Have a nice week !